The best way to plan your project, vacations, resolutions, or your entire year? All on one big (11″x17″) sheet of paper. For years I’ve been using a 52-week calendar to plan projects, track vacations, and even make sure I don’t break the chain. Print out one for every resolution! The 52 week view makes it much easier to focus on the weeks available to you and not be distracted by month boundaries. Ever been in a planning meeting where everyone is flipping through their calendar to figure out their schedule for the three month project? Interested? To get you started I’ve attached two versions below, one starting Nov 1, 2015, and the second for Jan 2016. You know, for all you early New Year’s resolution types. If you’d like the Word template to customize it for your needs just drop me a note. 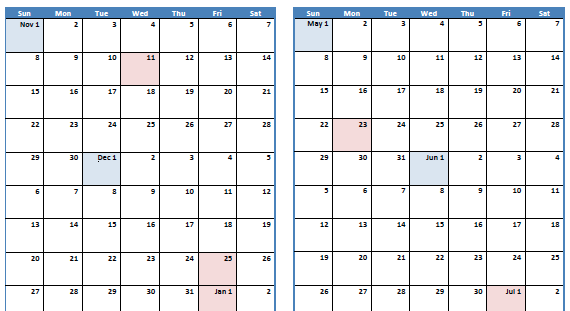 The red-shaded days are Saskatchewan stat holidays, the blue-shaded days are the start of each month (if it isn’t also a holiday).